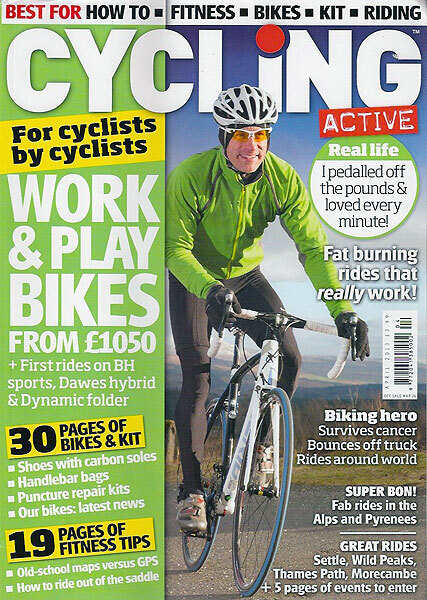 The April 2013 issue of Cycling Active magazine is on sale from Wednesday, February 27. In the latest issue we present 30 pages of bike and cycling product reviews, including a selection of bikes starting at £1050. There are also grouptests of sub-£150 carbon-soled cycling shoes, a round-up of handlebar bags and a look at puncture repair kits. We talk to Jame Golding, who tells his inspiration story of fighting back from cancer to ride across America for charity. And there’s Ian Tovell’s story – who went from 24 stone to 12 stone thanks to his new-found love of cycling.